It’s almost too easy to fall in love with a fruit like Zespri SunGold Kiwifruit this season! With 3 times as much vitamin C as an orange and as much potassium as a medium banana per serving of 2 kiwis, it can help boost your health around the holidays! Not only are they bright, sweet, and refreshingly flavorful, they’re an easily portable snack while you’re out running all those shopping errands! Just cut a kiwi in half, scoop out the flesh with a spoon, and place it in an on-the-go container. Plus, with these nutritious recipes, you now have a simple way to add these to some of your other favorite holiday fares like eggnog or stuffing! 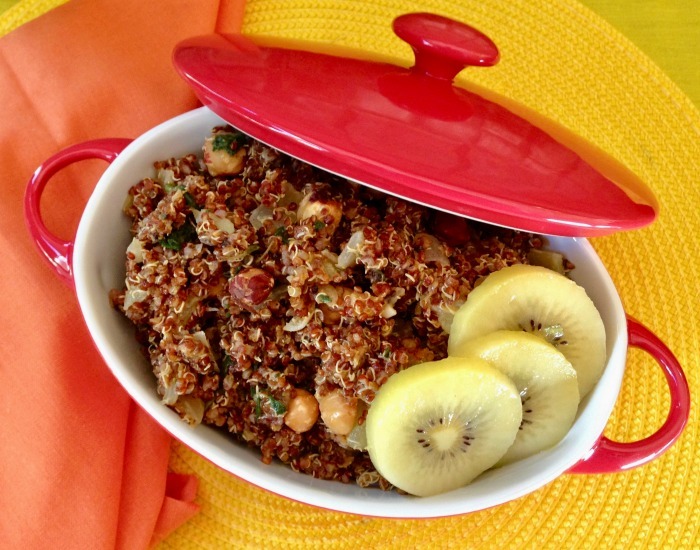 Zespri SunGold Kiwifruit makes its delicious holiday debut nestled inside savory quinoa stuffing. This tangy twist on a holiday classic features roasty-toasty hazelnuts, crunchy celery, and warming cinnamon that fills every room in the house with the comforting smells of fall. This season, gather your family to bake up a little bit of FUNand a whole lot of YUM. Visit https://www.zesprikiwi.com/where-to-buy-kiwifruit/ to find out where to buy Zespri SunGold Kiwifruit. Preheat oven to 350 degrees Fahrenheit and lightly grease a medium sized baking dish. In a skillet over medium high heat, heat oil and butter. Toss in the onion and cook for 6-7 minutes, until softened and starting to brown. 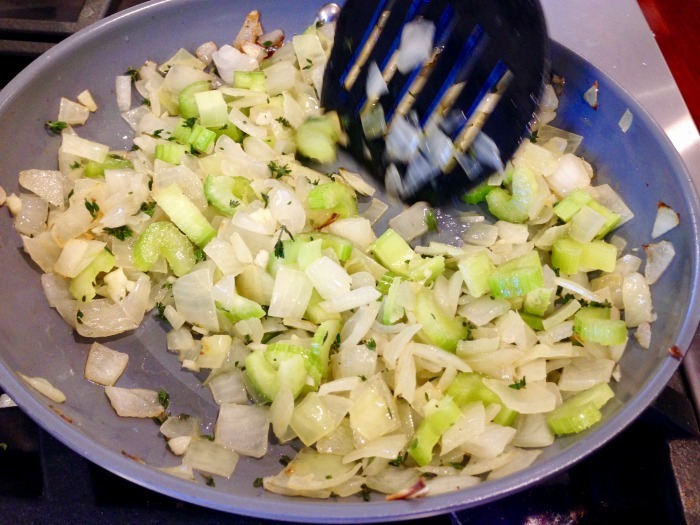 Add garlic, thyme, celery, and water, and cook for about 5 more minutes, or until no more liquid remains, about 5 minutes. Remove from heat. 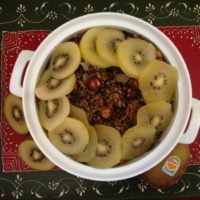 This recipe was developed for Zespri SunGold Kiwi fruit and is a sponsored post.